Blowout Sale! 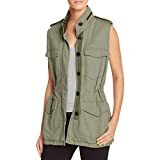 Up to 56% off on Vests at Felicianeo. Top brands include Hotouch, Joie, Woman Within, rag & bone, Triple9shop, Lydia USA, Romwe, Toad&Co, MakeMeChic, TheMogan, Sympli, Monrow, EGELEXY, Disney, T.SEBAN, Overland Sheepskin Co, NE PEOPLE, Gemijack, & BCBGMAXAZRIA. Hurry! Limited time offers. Offers valid only while supplies last.